If you’re installing a cell phone signal booster, you need to know where the nearest cell phone towers are. You also need to know which of those towers is owned by your chosen carrier. Sure, you can drive around town and take note of every cell phone tower in your area, but you won’t know which carriers are on those towers. If you’re thinking “there has to be an easier way,” I’m here to tell you that there is. 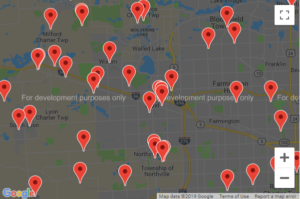 There are a handful of online cell phone tower locators you can use to find your carrier’s tower near your home. Best of all, these sites are fairly easy to use. Before I walk you through each of these sites, there’s something you need to know. Solid Signal cannot verify that that the information on these sites is 100 percent accurate. Keep in mind that cell carriers are constantly installing and taking down towers all across the country. This can make it hard for these third-party websites to keep up. That said, it never hurts to check these sites. The information they provide can help you mount your cell booster antenna for the best reception. 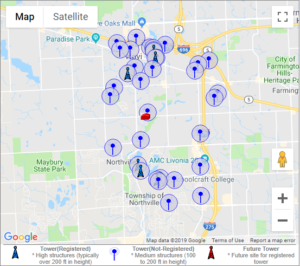 My experience: I entered my old address and the site listed 16 towers, zero new towers, and 41 antennas within a three-mile radius. I use ATT as my wireless carrier. If I were still living at this address, I might have a problem. There were Cricket, Nextel, and T-Mobile antennas, but none for ATT. Then again, some of the towers listed under other company names might be ATT carriers. When I punched in my current address, I easily found a tower clearly marked AT&T Wireless. (One of the many reasons I’m glad I moved!) Just for fun, I also entered Solid Signal’s address and included the image above. Final verdict: This one’s a keeper despite its outdated design. Look, you’re using it to find the cell phone towers in your area. So it doesn’t have to have the latest bells and whistles. Leave that to your favorite ecommerce sites. AntennaSearch.com is all about information, and this site delivers that. If you need to know where your carrier’s tower is located, it’s worth it to invest a little time on this site to find it. Network: enter your network type, such as 4G-LTE, etc. Final verdict: If you enjoy scrolling around on Google Maps, you might like CellMapper.net. Sure, the site has its up sides, including searches targeted by carriers and transmission beam mapping. Despite those finer touches, its overall operation just didn’t appeal to me. That said, it works and that’s what really matters. If you need to find your carrier’s local antenna, this site does the job. Don’t avoid CellMapper just because I didn’t enjoy the experience. My experience: I entered my old address into CellReception.com. This site produced a Google map with digital “pins” used to mark the location of all the cell towers. When I placed the cursor on each pin, a bubble would show the name of the company the owned the tower and its address. Final verdict: CellReception is a great website to find the information you need. It’s very easy to use and the details are clearly displayed on this clean, attractive site. 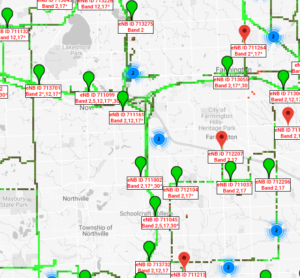 If you need a snapshot of your area’s tower locations, CellReception delivers. Something else you need to know about these sites: they offer no indication about the strength of cell coverage in these areas. 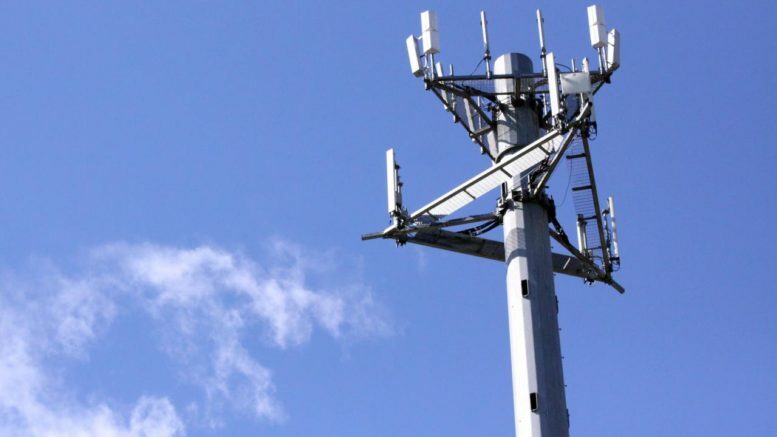 If you’re experiencing spotty signal and have a cell phone booster, you should check the online sources listed above to find exact tower locations. This lets you better position your cell booster’s outdoor antenna for the best signal reception. …When it comes to finding your carrier’s signal, there really is no better tool than this. When you get up on the roof with one of these, you can be confident that you’ll lock down the best direction to aim your cell booster antenna. If you’re someone who has to have the best of everything, we recommend you pool your resources with friends or family members to get this. It lowers the cost for each of you while making sure everyone gets the best cell phone reception in their homes. Hey, it’s an option, right? While all this might seem like a lot of work for mounting your cell phone signal booster antenna, it’s really not. Unless your wireless carrier plans on moving their cell towers, you just have to locate your local tower one time. This is why I recommend using one of the free websites listed above. Using the website and a printer, you can print up the map of your area and draw a line from the tower to your home. Use that as your guide when installing your cell phone signal booster antenna. If you need help, installation advice, or a product recommendation, call the Solid Signal techs at 877-312-4547. What do you need to do to “winterize” an antenna? Is TV in the United States as good as TV in other countries?